Why should communicators spend time and money on measurement? At least two reasons are frequently mentioned in theory and practice alike: doing things right and doing the right thing. First of all, effective management has to rely on up-to-date data. How do audiences use different media? Which social media influencers are relevant for our firm’s reputation? How large is our share of voice in the public debate on contested issues? Measurement tools can provide such insights (Macnamara, 2018). Clear goals and objectives are necessary to plan and evaluate communication activities, i.e. for doing things right. However, communication is sometimes planned and executed without being linked to the overall goals of the organization or client. Everyone in the profession can tell stories of campaigns, events, or social media channels that had great outreach and feedback from stakeholders, but had no impact on the bottom line or other tangible or intangible results. This is why – secondly – measurement is needed to prove that the right things are done in communications. Aligning communication activities to organizational strategy, e.g. via a performance management system, is a key driver of success in excellent communication departments (Tench et al., 2017, pp. 111-134). Being able to prove the contribution to overall organizational goals, in turn, is a prerequisite for being accepted and heard by top management. Having a seat at the table in the boardroom, either as a member or trusted adviser of the CEO and other executives, will remain wishful thinking unless practitioners focus on the strategic alignment of communication activities with organizational goals (Volk & Zerfass, 2017). Are communication practitioners aware of these necessities? Some empirical evidence is now available based on data from the Global Communication Monitor study series. This is the largest research project in public relations and strategic communication worldwide with annual or biannual surveys in different parts of the world. The studies are supported by key professional associations and renowned universities in the regions. PRIME Research is the key sponsor for the European and Asia-Pacific surveys. Full reports for each study are available online (see references). Details about methodologies and samples are described there. Data from the Global Communication Monitor 2017 stems from surveying 5,606 communication professionals in 82 countries across Europe, Asia-Pacific and Latin America (Zerfass et al., 2017; Macnamara et al., 2017; Moreno et al., 2017). The surveys have asked practitioners about the most important issues for communication management within the next three years. Not surprisingly, coping with the digital evolution and the social web was given the top priority in all regions of the world. Quite interesting differences are visible, however, when we take a closer look at business-related issues in the list (see figure). Strengthening the role of communications in supporting top-decision making is the one of the top three key priorities identified by communication professionals in Latin America. Nearly four out of ten respondents in the region (37 percent) are eager to work on a closer relationship with the executive level. Their peers in Europe and Asia-Pacific, on the other hand, seem to feel less pressure in this regard. In each case, 28 per cent of the communicators put a top priority on strategic role enhancement, putting it on the sixth rank of important issues for the field in both regions. 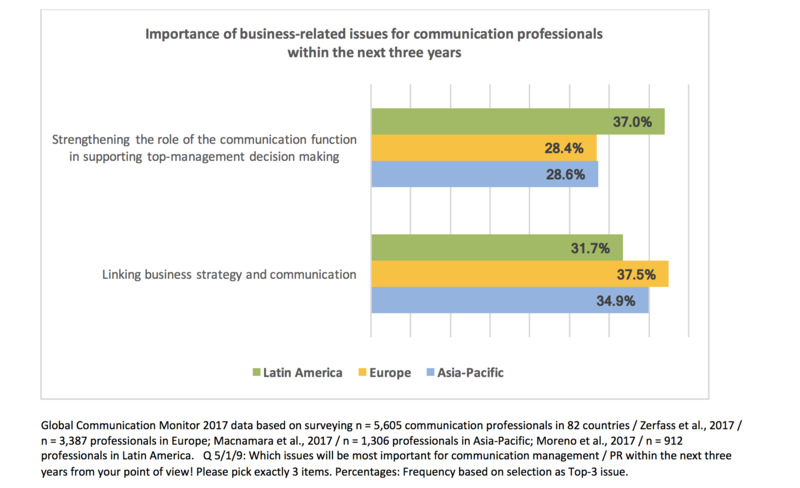 Quite surprisingly, less than one third of practitioners in Latin America (31.7 per cent) believe that aligning communication with business strategy is a key priority for the profession. The proportion of respondents who are concerned about contributing to organizational goals as the premier mean to gain recognition in the boardroom are smaller than the group who strives for that end (37.0 per cent). Asia-Pacific professionals are thinking somehow different as linking business strategy and communication is very relevant for 34.9 per cent in the sample. Practitioners in Europe seem to be even more focused on doing the right things: 37.5 per cent of the respondents in the region acknowledge the importance of strategic alignment. A larger number of practitioners have understood that it is necessary to deliver results before being heard or admitted to the boardroom. What does the research tell us? Globally, business goals are not top of mind for many practitioners – tactical aspects like dealing with digital media are more pressing. Regionally, communication professionals in Latin-American believe that it is very important to support top executives more intensively, but many have not fully understood the need to align their activities with overall goals. European practitioners, on the other hand, are much more focused on embedding themselves in overall strategic processes, which might lead the way to a broader understanding of their role and the contributions of communication departments to corporate success (Zerfass et al., 2017, pp. 90-97). Last but not least, communication professionals from Asia-Pacific have understood the importance of aligning communication and strategy as an important prerequisite for gaining more recognition at the upper levels of management. But the stasis of measurement practices in the region identified in previous studies (e.g., Macnamara & Zerfass, 2017) still seems to limit the development towards a more mature discipline. As any large-scale study, the quantitative surveys reported here have some limitations, and more research is needed to explore the reasons for the different stages of development across the world. Comparative research in public relations, which is rather nascent in our field (Volk, 2017), can help to close the gap and inform practitioners working in a global world of communications. Nevertheless, it is obvious that many communication practitioners around the world are not aware of the full range of business-related issues needed to perform excellent communications. Using measurement in public relations for doing the right things right is a way to succeed. Macnamara, J. (2018). Evaluating public communication: Exploring new models, standards, and best practice. Abingdon, UK: Routledge. Macnamara J., & Zerfass, A. (2017). Evaluation stasis continues in PR and corporate communication: Asia Pacific insights into causes. Communication Research and Practice, Communication Research & Practice, 3(4), 319-334. Tench, R., Verčič, D., Zerfass, A., Moreno, A., & Verhoeven, P. (2017). Communication Excellence – How to Develop, Manage and Lead Exceptional Communications. London, UK: Palgrave Macmillan. Volk, S. C. (2017). Towards Comparative Research in Strategic Communication: Analysis of Current Cross-National Studies and Future Directions. International Journal of Strategic Communication, 11(5), 434-453. Volk, S. C., & Zerfass, A. (2017). Alignment: Revisiting a key concept in strategic communication. Paper presented at the Annual Conference of the International Communication Association (ICA), Preconference Future Directions in Strategic Communication. San Diego, CA, USA, May 2017.